This section describes how to use Jails, which allow users who are comfortable with the command line to have more control over software installation and management. The jails infrastructure now uses uses the iocage backend and the warden backend has been deprecated and is no longer supported. Jail creation has been removed from the legacy UI but it can still be used to manage existing warden jails. It is recommended to recreate all legacy jails using the new UI, copy over any existing configurations, and delete the old jail datasets once the new jails are working as expected. To create new Jails, log into the new UI. By default, a FreeBSD jail is created. This provides a very light-weight, operating system-level virtualization. Consider it as another independent instance of FreeBSD running on the same hardware, without all of the overhead usually associated with virtualization. The jail installs the FreeBSD software management utilities so FreeBSD ports can be compiled and FreeBSD packages can be installed from the command line of the jail. It is important to understand that any users, groups, installed software, and configurations within a jail are isolated from both the FreeNAS® operating system and any other jails running on that system. Begin global jail configuration by choosing Jails ‣ Configuration to open the screen shown in Figure 13.1.1. Jails are automatically installed into their own dataset under the specified path as they are created. For example, if the Jail Root is set to /mnt/volume1/dataset1 and a jail named jail1 is created, it is installed into its own dataset named /mnt/volume1/dataset1/jail1. If any Plugins are already installed, the Jail Root, IPv4 Network, IPv4 Network Start Address, and IPv4 Network End Address are automatically filled. Double-check that the pre-configured IP address values are appropriate for the jails and do not conflict with addresses used by other systems on the network. 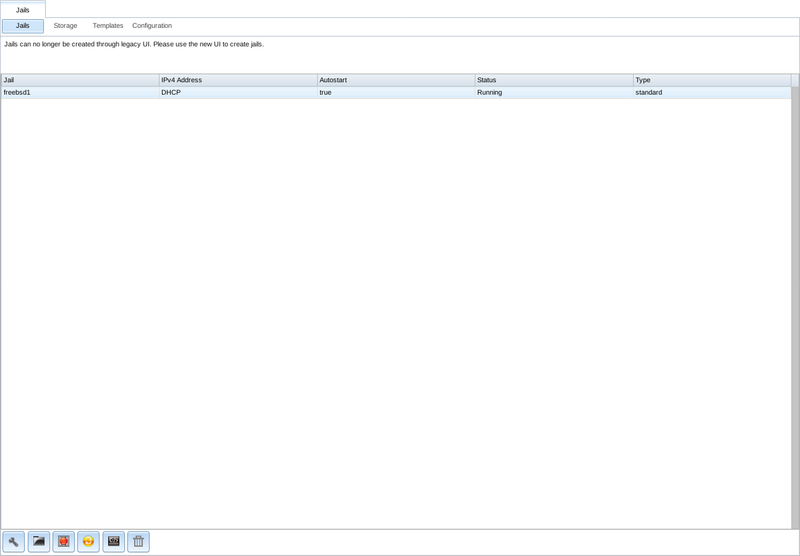 Table 13.1.1 summarizes the fields in this configuration screen. Refer to the text below the table for more details on how to properly configure the Jail Root and network settings. Some settings are only available in Advanced Mode. To see these settings, either click the Advanced Mode button or configure the system to always display these settings by checking the box Show advanced fields by default in System ‣ Advanced. Jail Root browse button Mandatory. Jails cannot be added until this is set. IPv4 DHCP checkbox Check this box if the network has a DHCP server. IPv4 Network string ✓ The format is IP address of network/CIDR mask. IPv4 Network Start Address string ✓ Enter the first IP address in the reserved range in the format host/CIDR mask. IPv4 Network End Address string ✓ Enter the last IP address in the reserved range in the format host/CIDR mask. IPv6 Autoconfigure checkbox Check this box if the network has a DHCPv6 server and IPv6 will be used to access jails. IPv6 Network string ✓ Enter the network address for a properly configured IPv6 network. IPv6 Network Start Address string ✓ Enter the first IP address in the reserved range for a properly configured IPv6 network. IPv6 Network End Address string ✓ Enter the last IP address in the reserved range for a properly configured IPv6 network. Collection URL string ✓ Changing the default may break the ability to install jails. When selecting the Jail Root, ensure that the size of the selected volume or dataset is sufficient to hold the number of jails to be installed as well as any software, log files, and data to be stored within each jail. At a bare minimum, budget at least 2 GiB per jail and do not select a dataset that is less than 2 GiB in size. When adding storage to a jail, be aware that the path size is limited to 88 characters. Make sure that the length of the volume name plus the dataset name plus the jail name does not exceed this limit. If the network contains a DHCP server, it is recommended to check the box IPv4 DHCP (or IPv6 Autoconfigure, for a properly configured IPv6 network). This prevents IP address conflicts on the network as the DHCP server automatically assigns the jail the next available lease and records the lease as in use. If a static IP address is needed so that users always know the IP address of the jail, enter the start and end address for the IPv4 and/or IPv6 network. The range defined by the start and end addresses will be automatically assigned as jails are created. For example, when creating 5 jails on the 192.168.1.0 network, enter a IPv4 Network Start Address of 192.168.1.100 and a IPv4 Network End Address of 192.168.1.104. When creating a start and end range on a network that contains a DHCP server, it is important to also reserve those addresses on the DHCP server. Otherwise, the DHCP server is not aware that those addresses are being used by jails. This lead to IP address conflicts and weird networking errors on the network. FreeNAS® automatically detects and displays the IPv4 Network to which the administrative interface is connected. This setting is important. The IP addresses used by the jails must be pingable from the FreeNAS® system for the jails and any installed software to be accessible. If the network topology requires changing the default value, a default gateway and possibly a static route need to be added to the specified network. After changing this value, ensure that the subnet mask value is correct, as an incorrect mask can make the IP network unreachable. When in doubt, keep the default setting for IPv4 Network. With VMware, make sure that the vswitch is set to “promiscuous mode”. With VirtualBox, make sure Network -> Advanced -> Promiscuous Mode is not set to “Deny”. Table 13.1.2 summarizes the available options. Most settings are only available in Advanced Mode and are not needed if the intent is to create a FreeBSD jail. 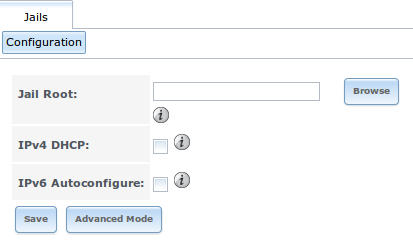 To see these settings, either click the Advanced Mode button or configure the system to always display these settings by checking the box Show advanced fields by default in System ‣ Advanced. Jail Name string Mandatory. Can only contain letters, numbers, dashes, or the underscore character. Template drop-down menu ✓ Contains any created custom templates. IPv4 DHCP checkbox ✓ If unchecked, make sure that the defined address does not conflict with the DHCP server’s pool of available addresses. IPv4 address integer ✓ This and the other IPv4 settings are grayed out if IPv4 DHCP is checked. Enter a unique IP address that is in the local network and not already used by anyother computer. IPv4 netmask drop-down menu ✓ Select the subnet mask associated with IPv4 address. IPv4 bridge address integer ✓ Grayed out unless VIMAGE is checked. See NOTE below. IPv4 bridge netmask drop-down menu ✓ Select the subnet mask associated with IPv4 bridge address. Grayed out unless VIMAGE is checked. IPv4 default gateway string ✓ Grayed out unless VIMAGE is checked. IPv6 Autoconfigure checkbox ✓ If unchecked, make sure that the defined address does not conflict with the DHCP server’s pool of available addresses. IPv6 address integer ✓ This and other IPv6 settings are grayed out if IPv6 Autoconfigure is checked. Enter a unique IPv6 address that is in the local network and not already used by any other computer. IPv6 prefix length drop-down menu ✓ Select the prefix length associated with IPv6 address. IPv6 bridge address integer ✓ Grayed out unless VIMAGE is checked. See NOTE below. IPv6 bridge prefix length drop-down menu ✓ Grayed out unless VIMAGE is checked. Select the prefix length associated with IPv6 address. IPv6 default gateway string ✓ Grayed out unless VIMAGE is checked. Used to set the jail’s default gateway IPv6 address. MAC string ✓ Grayed out unless VIMAGE is checked. Unique static MAC addresses must be entered for every jail created if a static MAC address is entered. NIC drop-down menu ✓ Grayed out if VIMAGE is checked. Can be used to specify the interface to use for jail connections. Autostart checkbox ✓ Uncheck if the jail will be started manually. VIMAGE checkbox ✓ Gives a jail its own virtualized network stack. Requires promiscuous mode be enabled on the interface. NAT checkbox ✓ Grayed out for Linux jails or if VIMAGE is unchecked. Enables Network Address Translation for the jail. The IPv4 and IPv6 bridge interface is used to bridge the epair(4) device, which is automatically created for each started jail, to a physical network device. The default network device is the one that is configured with a default gateway. So, if em0 is the FreeBSD name of the physical interface and three jails are running, these virtual interfaces are automatically created: bridge0, epair0a, epair1a, and epair2a. The physical interface em0 will be added to the bridge, as well as each epair device. The other half of the epair is placed inside the jail and is assigned the IP address specified for that jail. The bridge interface is assigned an alias of the default gateway for that jail or the bridge IP, if configured; either is correct. Click Jails to view and configure the added jails. In the example shown in Figure 13.2.1, the list entry for the jail named xdm_1 has been clicked to enable that jail’s configuration options. The entry indicates the jail name, IP address, whether it will start automatically at system boot, if it is currently running, and jail type: standard for a FreeBSD jail, or pluginjail if it was installed using Plugins. Edit Jail: edit the jail settings which were described in Table 13.1.2. After a jail has been created, the jail name and type cannot be changed. These fields are grayed out. To add storage, click the Add Storage button for a highlighted jail entry to open the screen shown in Figure 13.2.2. This screen can also be accessed by expanding the jail name in the tree view and clicking Storage ‣ Add Storage. After storage has been added or created, it appears in the tree under the specified jail. In the example shown in Figure 13.2.3, a dataset named tank/data has been chosen as the Source as it contains the files stored on the FreeNAS® system. When the storage was created, the user browsed to /usr/local/ in the Destination field, then entered test as the directory. Since this directory did not already exist, it was created, because the Create directory box was left checked. The resulting storage was added to the freebsd1 entry in the tree as /usr/local/test. The user has clicked this /usr/local/test entry to access the Edit screen. A mounted dataset does not automatically mount any of its child datasets. While the child datasets may appear to be browsable inside the jail, any changes are not visible. Since each dataset is considered to be its own filesystem, each child dataset must have its own mount point. Separate storage must be created for any child datasets which need to be mounted. To delete the storage, click the Delete button.